BANK HOLIDAY BARGAINS: Final reductions in the Sevenoaks sale | What Hi-Fi? * Yamaha CD-S300/A-S300 CD & amplifier/Wharfedale Diamond 121 speakers £479 - Save £228. 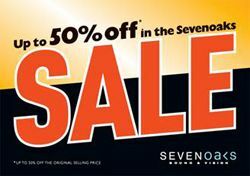 For more great deals this Bank Holiday, go to the Sevenoaks website.